PartyCheap has a large collection of St. Patrick's Day Decorations and party supplies! Green and white items are the most popular Irish holiday decorations and they can be used at your home or office to celebrate Ireland. PartyCheap's Irish Decorations and Party Supplies may also be used to decorate for a theme party, to welcome someone home after a trip to Ireland, or to as a going away party for someone who will be traveling there! St. Patrick's Day is not the only day to celebrate your Irish heritage! Our Irish Flag Cutout is a simple and inexpensive way to display your Irish pride every day! It can be hung from the wall or placed on your front door for guests to see as they enter. After you've had your Irish party, check out all of PartyCheap's International theme decorations and party supplies and party your way around the world! The Irish take pride in their country and heritage, especially when it comes to a big holiday or celebration! PartyCheap supplies great Party Decorations and Party Supplies to help you have the best Irish party possible! Decorate your porch rails or entry ways with the Irish Fabric Bunting to welcome your guests to your party and to extend the festivities to the outside! Have our Green and Gold Twirly Whirls hang from the ceiling to create a fun party atmosphere. Serve up some traditional Irish food for your party and decorate your food table with our Irish Plastic Tablecover. It wouldn't be an Irish party without some shamrocks hanging around the room, hang some Green Foil Metallic Shamrocks behind the food table, so people will be drawn to those delicious treats. No Irish party could be complete without displaying the Irish flag! Our Ireland Flag Wall Decal is a great decoration that you can place where ever your inner designer feels it would best suit your party space. PartyCheap also offers the Irish Flag Cutout and the Flags and Shamrocks Banner if the large decal does not suit your space. An Irish party is going to be loud with lots of green, so help your guests get into the spirit by offering them some fun party favors! We have great St. Patty's day and Irish gathering party favors such as our Irish Eyes Party Assortment, which is great for large gatherings as it supplies 50 people with party wear. You can even incorporate a party favor into a decoration. Our Shamrock Beads can be placed on a food table as decorations and while your guests fill their plates they can grab some fun festive beads! PartyCheap offers other costume or party outfit pieces for an Irish theme with our Glittered Shamrock Boppers and our Prismatic St. Patrick's Vest! Make sure you look as great as your party venue! There is a wide selection of party wear from PartyCheap's Irish Party Decorations collection, so you are sure to find something that suits your style and party needs! As well as our other party wear, PartyCheap also has St. Patrick's Humorous Party Buttons to give to your guests! These buttons decorated with funny phrases make great conversation pieces for your next Irish party's guests! 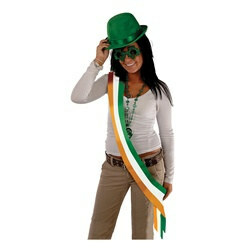 Even if you are not of Irish heritage, you can still get in on the fun with PartyCheap's Fabric Irish For a Day Sash! Check out all of our Irish Party Decorations and enjoy your event!